What Beer Goes With Hasenpfeffer? Hasenpfeffer (also spelled hasenfeffer) is a traditional German stew made from marinated rabbit or hare. Hase is German for hare and Pfeffer is German for pepper, although in this case it rather refers to the small pieces of meat. The dish is prepared from smaller parts of a rabbit which are not suitable for roasting. These are braised with onions and wine and the marinade is thickened with the animal's blood. Growing up in Germany, I have actually had this food item. Having said that, I'm not sure how many of you out there are either fans of hasenpfeffer, or tree-hugging lovers of any random small woodland creature. One of those groups, I will in short order make somewhat happy with mild snickering. The other of those groups, I will likely offend enough that they make yet another internal comment about how inane I am. Let me back-track for a minute, and let you in on the reason for this post. I have been growing grass in the side yard. I do this Annual Grass Growing Contest because we have two four-legged animals in our household who have decided to use that area for their own private racetrack. That running around means they necessarily tear up the grass there. So I am forced to fence off that section every Spring for about a month. Today was the first time I cut that grass, and allowed the afore-mentioned four-legged creatures (AKA Lila and Milo) on the turf. However, before they even stepped foot on the new grass, and while I was mowing, I happened up on an itty-bitty bunny rabbit. This surprised me because we now have a family of foxes in the area and they have done a superb job of handling the small woodland creature population --- rabbits, squirrels, chipmunks, and others. We also have a population "birds of prey" that are on the upswing, so that helps too. Well, it appears that the little bunny's mother might have met her fate recently. 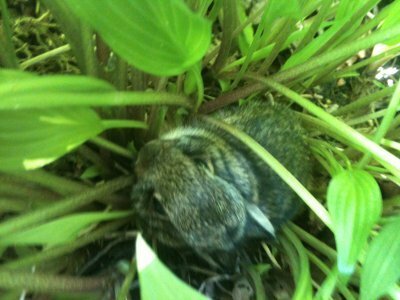 I found their nest, as well as two of this bunny's siblings that had also perished. Lucky for me, our dogs did not find any of this. They were too busy laying in the sun, thankfully. So this tiny bunny, probably one or two months old (old enough to have fur and be able to minimally get around), was crawling through the grass trying to leave. Here was my dilemma: Do I send this bunny to its "maker", or did try to send it on its way and let nature take its course? After a call to the missus, I decided to move it to the front yard hostas and let it get around if it can. A couple checks on it later....and the little guy had successfully moved out of range of my interest. Or it had become "fox food". I'm not sure. In the end, I realized this single, solitary bunny would never be enough to go through the effort of actually making the delicious hasenpfeffer we know and love. Maybe the foxes will send me a thank-you note. Magic indeed. As of last night, I have finally entered the mobile online world with some sort of Samsung inertnet capable phone. Re-reading that statement makes me sound a lot like Bakes. I can imagine myself saying, "Stay off my lawn, you damn whippersnappers!" Or shooting the neighborhood kids' football and throwing it back over the fence. Pretty sure Bakes does all that stuff. And more. However, I wanted to take this opportunity to mark my passage into the year 2005. Yes, I've finally caught up with the middle of this decade in terms of my phone. In other areas (my clothes, my haircut, my favorite sayings, etc.) I am woefully stuck in the 1970s, 1980s and 1990s. Although, by that standard, I'm clearly about 60 years ahead of Bakes. Sorry, Brian, but it's true. However, with this new toy, my phone odyssey begins. We started looking at the phones, not intending to do anything. She saw a few she liked, and the guy mentioned that for her needs, she wouldn't want a PDA phone (Blackberry, etc.). In the meantime, the wife was liking the new Samsung inertnet phone. So we actually decided to get her one. At the same time, they needed to look up the account to make sure we had the data plan for it (we didn't, but switched to an unlimited data plan that cost the same as our previous plan). We also found out that I was due a "free" upgrade too. Turns out they picked up all the re-activation fees and a few other things like the first month of the data plan (normal for a 3rd party seller I assume). So that's the story of how our new phone osyssey started. A seemingly innocent trip to Radio Shack before dinner. As for my phone inertnet usage, let's just say I've used the inertnet connection on my previous phone with limited shock and awe. Plus I was always afraid of overages on the data plan. No such fear now! I've even posted my first mobile phone post on TBS this morning. So, as you can clearly see, my antiquated days are coming to an end. At least in terms of my phone and the inertnet. As for my clothes and haircut, maybe I'll just have to consult with Bakes for that.